antichrist, the man and his doctrine. Child of God, antichrist is not just an entity that will rule during the tribulation, but also a cunning methodology and theology, designed to lead many into the lake of fire. The spirit of antichrist has been alive and functioning for over 2000 years. Any doctrine that is opposite of what our Lord Jesus said, is of the antichrist spirit. Example 1: If some 'man of God' proclaims you can get to Heaven by paying indulgences or tithes. This is opposite of what Jesus taught, thus it is not of Christ, but antichrist. Example 2: If some 'man of God' proclaims you will be taken out before the tribulation. This also is 180 degrees in opposition of what Jesus taught, thus it is not of Christ, but antichrist. Example 3: If some 'man of God' proclaims your body will disappear leaving clothes behind. Paul teaches that those who teach this are fools. "Thou fool....Brethren, flesh and blood cannot inherit the kingdom of God." The above examples (and many more) were taught to the masses and shockingly accepted due to; a fear of questioning apparent authority, laziness to search the word and or misinformation from the 'man of God'. Dearest children be not passive in this regard, the altering of Christ's prophetic teachings are damnable with the loss of salvation. Pick not up that doctrine that feels or sounds palatable. Remember, it is "he that overcomes to the end" that shall be rewarded. Not he that carelessly waltzes through life, feasting on and funding blasphemous doctrine, whose fruit will kill the unprepared mind and body. What can we say? Should never a rebuke be given the 'man of God' or all of Christendom gone astray? Far from it beloved, in fact judgment always starts at the house of God. When the so-called 'anointed' are teaching heresy, they will be touched and labeled as Paul states: fools, bastards and liars. How would you react if 95% of the clergy taught as dogma that: anyone could go to Heaven if they were simply 'nice' to other people? Your blood would boil over with the fury of righteous indignation. Why, because it is a lie of satan and would send people to hell. Thus it is with any false doctrine. Regardless of the intent from the 'man of God'; be it ignorance or trickery, his message is a false doctrine and a malignant lie. With only a one degree shift of truth, over time you are miles of course. The pre-tribulation teaching is a lie and will send billions to hell. Especially when believers find themselves going through the tribulation period, now thinking the rapture was only a fable. The fruit of poisonous teachings and false indoctrination will take it's toll; when the flock scatters, they take the mark, fulfilling the falling away. They will only remember the ingrained words of the television star teachers or their country club's denominational doctrines. They will have forgotten the Lamb's words, "After the tribulation of those days... will I gather mine elect". Neither shall they consider the prophet Isaiah, "Hide for a little while, until the indignation pass". These 'men of God' attempt to shield themselves with the scripture that says, "the gifts and calling of God are without repentance." Agreed, the 'man of God' should not feel guilt for being called into a particular position. However, this verse is not saying, never admit error, but simply not to 'turn away' from your calling. Once called you are called, anything less is disobedience as seen in the model of Jonah. However the lies of false teachings and blasphemies, demand the foreign concept of repentance from these denominationally programmed, stiff necked dictators. Evil, Vipers, Cunning, Serpents, Rotting Corpses, Ravenous, Hypocrites, Stiffnecked, Deceivers, Excessive, Extortioners, Covetous, Fools, House Devourers, Suspicious Yeast, Blind, Bastards, Uncircumcised, Liars, Wicked, Wolves, Children of Hell and Children of satan. Greater works than these will you do also. Better is a poor wise child, than an old foolish king that will not hear correction. Luther makes a brilliant observation, that the Church has developed "delicate ears". In our present day vernacular, that means 'politically correct' ears. Which doctrine says, 'Never offend anyone at anytime'. In today's churches, most would pass out or call for an excommunication, if they ever heard a rebuke from the Holy Spirit. Luther's rebukes of the day were the zenith of creative conflict, used to shake foundations, rather than suffering lies of monolithic uniformity. His positions were unrepentant, through scriptural wrath and righteous indignation. Keep in mind Luther was taking on the entire host of the only Church on earth. Popes, Cardinals, Bishops, Priests and it's entire congregation with death threats abounding. I have long since fired the Catholic Church from being my spiritual advisor decades ago. Thusly, I would count it a blessing to be scorned of all, including the entire sect called Protestants, to be in the company of poetically creative lie chasers as Jesus, Paul and Martin Luther. "Unless I can be instructed and convinced with evidence from the Holy Scriptures or with open, clear, and distinct grounds of reasoning ... then I cannot and will not recant, because it is neither safe nor wise to act against conscience. Here I stand. I can do no other. God help me! Amen." I have indeed inveighed sharply against impious doctrines, and I have not been slack to censure my adversaries on account, not of their bad morals, but of their impiety. And for this I am so far from being sorry that, I have brought my mind to despise the judgments of men and to persevere in this vehement zeal, according to the example of Christ, who, in His zeal, calls His adversaries a generation of vipers, blind, hypocrites, and children of the devil. Paul, too, charges the sorcerer with being a child of the devil, full of all subtlety and all malice; and defames certain persons as evil workers, dogs, and deceivers. In the opinion of those delicate-eared persons, nothing could be more bitter or intemperate than Paul’s language. What can be more bitter than the words of the prophets? The ears of our generation have been made so delicate by the senseless multitude of flatterers that, as soon as we perceive that anything of ours is not approved of, we cry out that we are being bitterly assailed; and when we can repel the truth by no other pretense, we escape by attributing bitterness, impatience, intemperance, to our adversaries. What would be the use of salt if it were not pungent, or of the edge of the sword if it did not slay? Accursed is the man who does the work of the Lord deceitfully. You see, however, which is called the Court of Rome, and which neither you nor any man can deny to be more corrupt than any Babylon or Sodom, and quite, as I believe, of a lost, desperate, and hopeless impiety, this I have verily abominated, and have felt indignant that the people of Christ should be cheated under your name and the pretext of the Church of Rome; and so I have resisted, and will resist, as long as the spirit of faith shall live in me. Not that I am striving after impossibilities, or hoping that by my labours alone, against the furious opposition of so many flatterers, any good can be done in that most disordered Babylon; but that I feel myself a debtor to my brethren, and am bound to take thought for them, that fewer of them may be rained, or that their ruin may be less complete, by the plagues of Rome. For many years now, nothing else has overflowed from Rome into the world—as you are not ignorant—than the laying waste of goods, of bodies, and of souls, and the worst examples of all the worst things. These things are clearer than the light to all men; and the Church of Rome, formerly the most holy of all Churches, has become the most lawless den of thieves, the most shameless of all brothels, the very kingdom of sin, death, and hell; so that not even antichrist, if he were to come, could devise any addition to its wickedness. Here is that enemy of yours, Leo, or rather of your Court; by his example alone we may learn that an enemy is not more baneful than a flatterer. For what did he bring about by his flattery, except evils which no king could have brought about? At this day, the name of the Court of Rome stinks in the nostrils of the world, the papal authority is growing weak, and its notorious ignorance is evil spoken of. 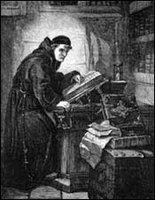 Martin Luther (1483–1546). Christian Liberty. ...This teaching shows forcefully that the Pope is the very Antichrist, who has exalted himself above, and opposed himself against Christ because he will not permit Christians to be saved without his power, which, nevertheless, is nothing, and is neither ordained nor commanded by God. This is, properly speaking to exalt himself above all that is called God as Paul says, 2 Thess. 2, 4. Even the Turks or the Tartars, great enemies of Christians as they are, do not do this, but they allow whoever wishes to believe in Christ, and take bodily tribute and obedience from Christians. And when we distinguish the Pope's teaching from, or measure and hold it against, Holy Scripture, it is found [it appears plainly] that the Pope's teaching, where it is best, has been taken from the imperial and heathen law and treats of political matters and decisions or rights, as the Decretals show; furthermore, it teaches of ceremonies concerning churches, garments, food, persons and [similar] puerile, theatrical and comical things without measure, but in all these things nothing at all of Christ, faith, and the commandments of God. Lastly, it is nothing else than the devil himself, because above and against God he urges [and disseminates] his [papal] falsehoods concerning masses, purgatory, the monastic life, one's own works and [fictitious] divine worship (for this is the very Papacy [upon each of which the Papacy is altogether founded and is standing]), and condemns, murders and tortures all Christians who do not exalt and honor these abominations [of the Pope] above all things. Therefore, just as little as we can worship the devil himself as Lord and God, we can endure his apostle, the Pope, or Antichrist, in his rule as head or lord. For to lie and to kill, and to destroy body and soul eternally, that is wherein his papal government really consists, as I have very clearly shown in many books. Excerpts from: Article IV: Of the Papacy.